MORE THAN a year after the release of their latest album, "As Cruel as School Children," New York's Gym Class Heroes will finally make an appearance on Oahu next week. Led by MC Travis "Schleprok" McCoy, the band has established a niche similar to that of one-hit wonder Crazy Town, matching rock stylings with hip-hop rhymes, while backing everything with live instruments instead of recorded samples. 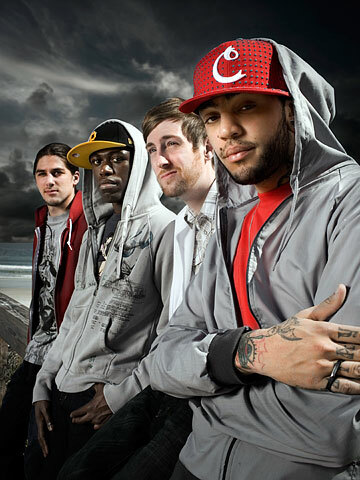 Gym Class Heroes plays Pipeline Cafe on Wednesday. CONGRATS TO Chinatown's NextDoor and Aiea's Panama Hattie's, which both celebrate anniversaries this weekend. NextDoor's second birthday started Thursday with a fashion show by Dan Weaver and DJs Eskae and Cookiehead Jenkins on the decks, and continues tonight with DJ mr.nick and a special guest set by DJ Fred Everything. Torry Tukuafu will host "Showdown in Chinatown" early Saturday, followed by the return of "Favela Funk" later in the night with special guest DJ Rex Riddem. REMEMBER THE item I wrote last month about local rockers Resistor playing their last shows? Well, it looks like the band isn't ready to call it quits just yet. You can check them out at 9 p.m. Saturday at Tropics in Kailua, or at 8 p.m. Aug. 18 at Gordon Biersch.